Giving a fruit tree to your nearest & dearest could be a great way to ensure they have a good supply of their own home grown fruit! Every little bit helps, and the nice thing about a tree is that they are there for years to come. We planted two apple trees in our relatively small garden 7 years ago, and have been enjoying their apples ever since (and we're not really that green fingered, promise!). One of the nice things about giving a tree is that they last longer than many presents, including flowers - and if the recipient can enjoy the fruits of their planting labours, that makes them ever nicer gifts still! We also have raspberry bushes & have enjoyed raspberries with natural yogurt (a delicious and healthy snack any time of the day) or ice-cream. I've yet to make raspberry jam, though. 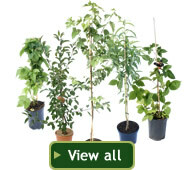 Tree2mydoor.com sells fruit trees online and you can either have the tree sent to you to give to the recipient personally or have it sent to their home - here's a selection of their fruit trees.